Ever tried glamping before? If you’ve moved on from the usual ways of accommodation, this here is something different. Glamorous camping or glamping is now a way of life, and is slowly catching eyeballs across the state. It’s a new way to experience the place you’re visiting, giving you those rustic feels mixed with luxury you really don’t expect. 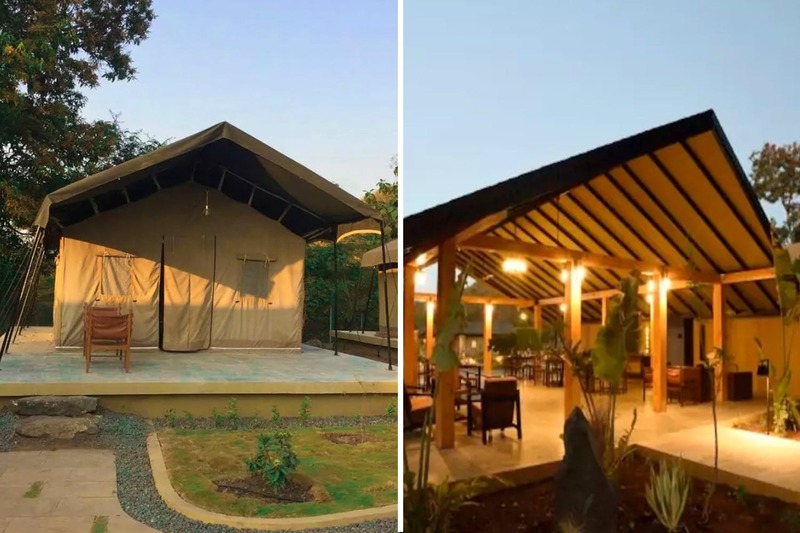 These forest tents are in the middle of a dense forest near Nashik and are the real deal, coupled with a luxurious setting. You can drive down to Nashik and use Google Maps to follow the trail or just take local transport till Nashik and plot the location on the map. The eco resort is located a little distance from Nashik city. You’ll get the exact location as soon as you’ve booked your stay. The resort is spread over 120 acres, adjacent to 2,000 acres of reserved forestland. It’s called an eco destination because you’re in the midst of nature, so it’s the perfect place if you’re a nature enthusiast, with enough and more to observe. One of the best features, at least in our minds, is that there’s no internet, and with good intent. It’s a chance for you to escape all that you’re used to and live the rustic life. Once you’re done exploring the resort, you can even go to the nearby vineyards around Nashik city and have a ball of a time. Each tent will cost you a total of INR 10,000 (inclusive of taxes) per night, but it’s the experience that matters. For a lot of us, its trying out something new that makes those lasting memories, and this place is certainly on our list of must-dos!